This guide contains over 50 destinations to visit in and around Bangkok. I’ve discovered and explored all of these first hand from over 5 years of experience living in Bangkok. There’s so much in this Bangkok travel guide that you’ll never get bored. In my Bangkok travel guide, you will find plenty of popular attractions and loads of other local knowledge destinations. Forget about heavy guidebooks, you can fit this entire guide in your phone or tablet. No extra weight in your bag. 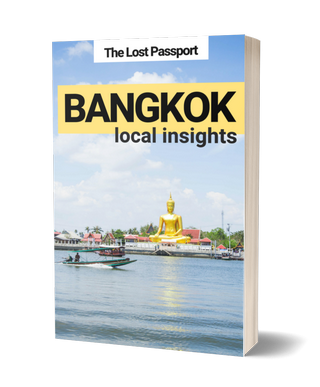 Which destinations are included in my Bangkok Travel Guide? 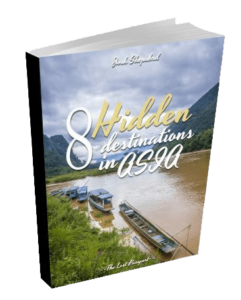 This ebook contains a huge range of destinations. Some you may have heard of, others are local secrets. Get detailed guides to floating markets, fresh markets, and night markets. Explore the canals of Amphawa Floating Market, dodge the train at the Maeklong Railway Market, and discover the pottery culture in the weekend market on Koh Kret, Bangkok’s island! Escape the city madness and laze away your summer days in these small green oasis throughout the city. There are small parks right in the city center which are perfect for a quick break. Alternatively, explore the huge Chatujak Park in Mo Chit, or the Sri Nakhon Wetland Park on Bang Krachao. There is much more nature in the city than you’d first think! Learn the local vibe with an overview of the different suburbs that make up Bangkok. Have you heard of Phra Khanong, Onnut or Thong Lor? This is where locals and expats actually hang out in Bangkok. Time for shopping? No worries, Bangkok has just about everything you need. Find the best shopping centers in Bangkok for clothing, electronics, and muchg more. The Bangkok travel guide contains 10 of my favorite bars to visit. Some are located in the city, others in the surrounding suburbs. You will get a great mix of bars to hang out at 7 days per week where you can enjoy great live music, east tasty local dishes, and get really cheap beers or whiskey! Don’t hang out at Khao Sarn Road for 7 days, explore the nightlife that Bangkok really has to offer! Why is your Bangkok Travel Guide unique? This guide is filled with local destinations. Many of these you won’t find in other guides. I’ve visited ALL these places first hand. Why do you know Bangkok so well? I lived in Bangkok for 5 years… yeah, that’s a pretty long time. I’ve spent a lot of time exploring the cityand surrounds. Can I get a printed copy? This guide is only available as PDF, however, that doesn’t stop you from printing it out! How is this guide different to your blog posts? My Bangkok related blog posts give you an introduction to destinations. This travel guide gives you step by step instructions on how to get to places, their opening hours, and costs. There is just way more detail in here! and so many more Bangkok destinations. Can I contact you with further questions? Sure, just drop me an email. I generally respond within 2 days. All purchases are made through a secure PayPal gateway. If you don’t have PayPal you can still use your credit or debit card through their system. This just guarantees your online safety!